Going without food and water from dawn to dusk during the holy month of Ramzan heightens Muslims' empathy for the world's 800 million hungry. It drives Islamic philanthropy in the form of fitra, sadaqa and zakat during this month of fasting and prayer. This annual giving puts Pakistan among the ranks of the most generous in the world. As the faithful choose who to give, it is important to support organized philanthropy that seeks to end local and world hunger in a systemic way. It requires understanding the causes of local and global hunger. It can also inspire social entrepreneurs to develop innovative solutions to world hunger. The world produces far more food than needed to feed its entire population of 7.6 billion people today. Yet, there is hunger in many parts of the world with 800 million people going hungry globally. There are two main reasons for it: Affordability and Conflict. The true cost of a meal should be calculated in terms of the percentage of average daily income in each location. By this measure, food is most affordable in North America and Europe and most expensive in Africa. The continent of Africa suffers both the crises of war and affordability. People going hungry in parts of the Middle East, particularly Syria and Yemen, are also victims of ongoing conflicts. A simple meal consisting of daal (pulses), vegetables, roti (bread) and chawal (rice) costs 7.6% of average daily income in Pakistan, according to a World Food Program report. It is more expensive than the cost of a similar meal in Bangladesh (5.4%), India (4.5%) and Myanmar (7%). But it is cheaper than Nepal (13%) and Tajikistan (15%). 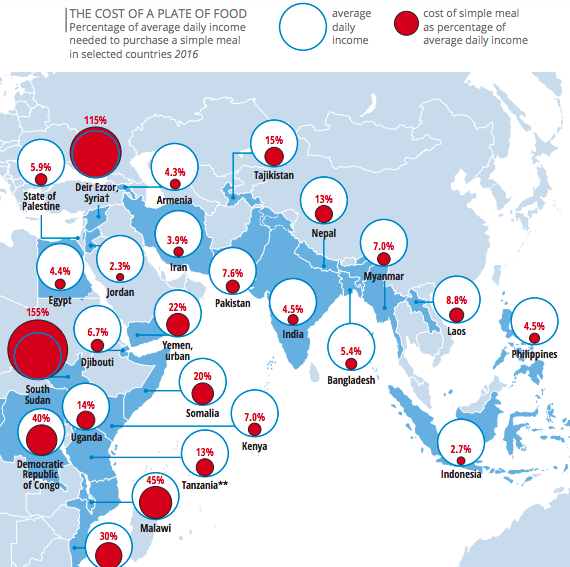 The costs in Asia and Africa are far higher than the cost of a similar simple meal of just 0.6% of average daily income in New York. The highest food costs are in the African nations of Malawi (45%) and South Sudan (155%). Tons of perfectly good food is discarded daily by restaurants and supermarkets when it reaches its stamped expiration date. It is the same story with leftover prepared food after corporate lunches and dinners and parties. Hannah Dehradunwala and Komal Ahmad, both Pakistani-American, have developed apps to match excess food with those in need of food. Hannah Dehradunwala co-founded Transfernation, a nonprofit startup with the aim of alleviating hunger beginning with New York City and Karachi. She has partnered with a fellow NYU student Samir Goel, an American of Indian descent. It's essentially an app and a website that enable leftover food at restaurants and corporate events to be distributed to the hungry. At this year's conference of Pakistani-American entrepreneurs in Silicon Valley, Komal Ahmad of Copia described how her company is helping solve hunger by reducing waste of millions of tons of perfectly good, healthy and edible surplus food. Her company's smartphone app matches those with excess food with those in need of food. The idea was born when Komal saw University of California at Berkeley's cafeteria regularly throwing away un-eaten food. It took her a couple of hours to persuade the cafeteria director to donate the food instead of throwing it away. His main concern was liability if someone ate the food and got sick and sued the university. Komal explained to him that a good samaritan law protects donors from liability in such cases. That was the key to getting him to agree to begin donating surplus food to charity. Komal's business helps donors, recipients and Copia as the match-maker. Donors get tax deduction for the in-kind donation, the hungry get fed and Copia receives a commission for their work. Cpoia is a Y Combinator company. It received its seed funding from Pakistani-American Amar Hanafi, a charter member of OPEN, Organization of Pakistani-American Entrepreneurs. Pakistanis donate generously to local charities in the country in the form of religiously mandated donations such as "zakat, sadaqa and fitrana". One of the key measures of empathy is generosity to others, the kind of generosity demonstrated in Pakistan by the likes of late Abul Sattar Edhi. The Edhi Foundation set up by the great man is funded mainly by small donations from ordinary people in Pakistan. "There is no sight in Pakistan more moving than to visit some dusty, impoverished small town in an arid wasteland, apparently abandoned by God and all sensible men and certainly abandoned by the Pakistani state and its elected representatives - and to see the flag of Edhi Foundation flying over a concrete shack with a telephone, and the only ambulance in town standing in front. Here, if anywhere in Pakistan, lies the truth of human religion and human morality." What Professor Anatol Lieven describes as "human religion and human morality" is the very essence of the Huqooq-ul-Ibad (Human Rights) in Islam. Abdus Sattar Edhi understood it well when he said, "there's no religion higher than humanity". "Righteousness is not that ye turn your faces towards the east or the west, but righteous is, one who believes in God, and the last day, and the angels, and the Book, and the prophets, and who gives wealth for His love to kindred, and orphans, and the poor, and the son of the road, beggars, and those in captivity; and who is steadfast in prayers, and gives alms." A recent article written by Shazia M. Amjad and Muhammad Ali and published in Stanford Social Innovation Review said that "Pakistan is a generous country. It contributes more than one percent of its GDP to charity, which pushes it into the ranks of far wealthier countries like the United Kingdom (1.3 percent GDP to charity) and Canada (1.2 percent of GDP), and around twice what India gives relative to GDP." OECD says corporate donations in Pakistan have increased from $4.5 million to $56.4 million over the last 15 years. Corporate donations are dwarfed by individual donations made as zakat, sadaqa and fitrana as commanded by the Quran. In addition to zakat, sadaqa and fitrana, Pakistanis spent about $3.5 billion on Eid ul Azha in 2017, according to analysts. This included sacrifice of $2.8 billion worth of livestock and another $700 million on clothes, shoes, jewelry and various services. This amount represent a huge transfer of wealth from urban to rural population, including many rural poor, in the country. It also brings philanthropic donations of Rs. 2.5 billion to Rs. 3 billion ($25-30 million) worth of animal hides which are sold to the nation's leather industry. A Michigan State University (MSU) study of 63 countries finds that Pakistanis have higher empathy for others than people in their neighboring countries. It also finds that the United States is among the most empathetic nations in the world. The MSU researchers, led by William J. Chopik, analyzed the data from an online survey on empathy completed by more than 104,000 people from around the world. The survey measured people’s compassion for others and their tendency to imagine others’ point of view. Countries with small sample sizes were excluded (including most nations in Africa). All told, 63 countries were ranked in the study, according to MSUToday, a publication of Michigan State University. The month of Ramzan heightens Muslims' empathy for the world's 800 million hungry. It drives Islamic philanthropy in the form of fitra, sadaqa and zakat during this month of fasting and prayer. This annual giving puts Pakistan among the ranks of the most generous in the world. It can also inspire social entrepreneurs to develop innovative solutions to world hunger. Pakistanis are among the most generous people in the world. They contributes more than one percent of the nation's GDP to charity, which pushes Pakistan into the ranks of far wealthier countries like the United Kingdom (1.3 percent GDP to charity) and Canada (1.2 percent of GDP), and around twice what India gives relative to GDP, according to Stanford Social Innovation Review. Average Pakistanis continue to be empathetic and generous in spite of the violence and the terror they have endured for over a decade. It can only be attributed to the strength of their faith and their adherence to what Prof. Lieven describes as "the truth of human religion and human morality".